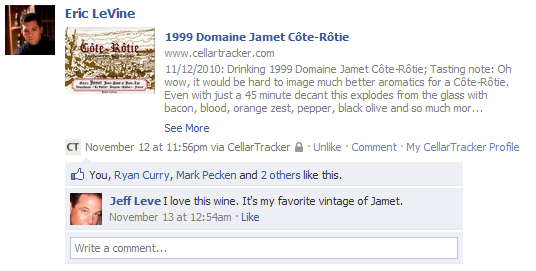 If you use Facebook and like to share the occasional wine or tasting note with friends or family, CellarTracker can place a nicely formatted and linked label image on your Facebook timeline to let your friends know what you are buying, drinking or tasting. As of July 2018, automatic posting is no longer possible due to changes with Facebook's API. How can I share to Facebook? On the full website, you can share any page to Facebook that contains the beige Share button in the toolbar, as shown below. You can also find a new Share to Facebook option in the drop-down menu to the right of your tasting notes (in list views). In the mobile apps, you will find a Share to Facebook button on the bottom of the tasting note page, consumed bottle page, or purchase page. Simply tap the button to share the note or wine with your friends.